This post is All about Fava Beans. I may be telling you some stuff you already know and maybe some stuff you didn’t know. When talking about fava beans, I find a lot of people are not familiar at all. I was introduced to them about 10 years ago in one of the finer San Francisco restaurants; Fleur de Lys, where it was served as a creamy lemony puree on a crostini with fresh parmesan cheese curls on top. Since I’ve moved to Sonoma County I’ve enjoyed them many ways with our fresh, farm to table dining style. And I can tell you this, no matter how they are prepared, they are delicious. Some people, that are familiar with fava beans, will say they are a PITA to work with as you have to first remove them from their pod, and then peel them from their first skin. But that isn’t necessarily so. I’ll tell you more as we go down Fava Bean Lane. There are two kinds of fava beans, ones that you eat, and ones that you grow as a crop cover. We’ll speak about the ones that you eat. 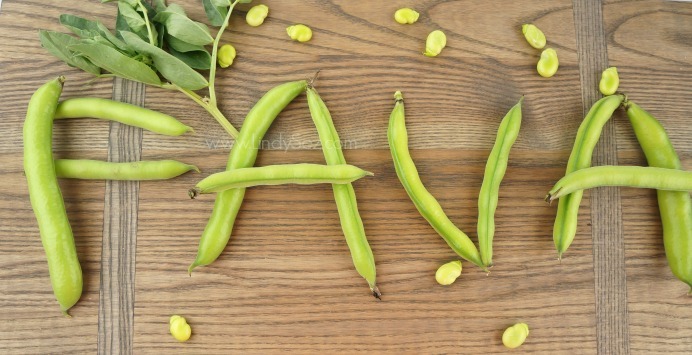 A Fava bean, also known as a broad bean, is one of the oldest cultivated foods and is extremely easy to grow. It has a very high hardiness rating and can survive even the coldest of winters. Come the warmer days and you will find them poking their heads up through the soil ready to greet spring. They do not tolerate high heat well, so generally, their growing season is from March to early July. A member of the pea family, fava beans have been used in ancient Greek and Mediterranean recipes since the Roman days. America is just beginning to embrace the fava bean, perhaps a bit because they look like lima beans and lima beans get a bad rap. Fava beans are not lima beans and don’t taste like lima beans. Mature peeled fava beans have a buttery texture and flavor. 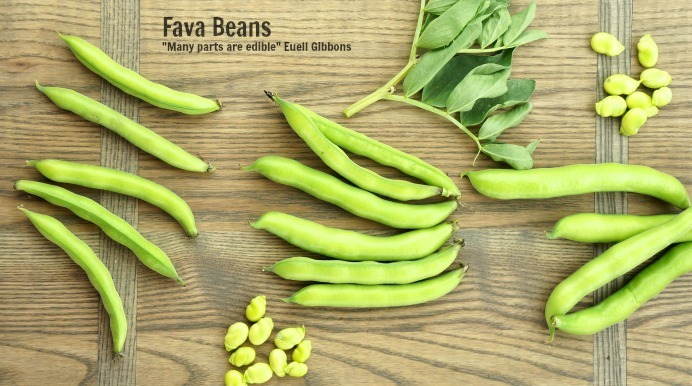 One of the coolest things about fava beans is that many parts are edible. Now that said, you wouldn’t want to be eating a mature bean in their pod, the pod would be very woody, but a small, new fava bean can be eaten lightly steamed, or sautéed. No peeling needed at all. Medium sized beans can be removed from the pod and then cooked without further peeling. But the large mature beans need to be peeled. Some say you can eat them without the second peeling, but I find the peel to be tough and bitter, so for me, it’s worth the extra effort to do a second peel. EVEN the leaves are edible. They can be used just like spinach or made into a pesto. The flavor of the leaf is the same as the flavor of the bean. 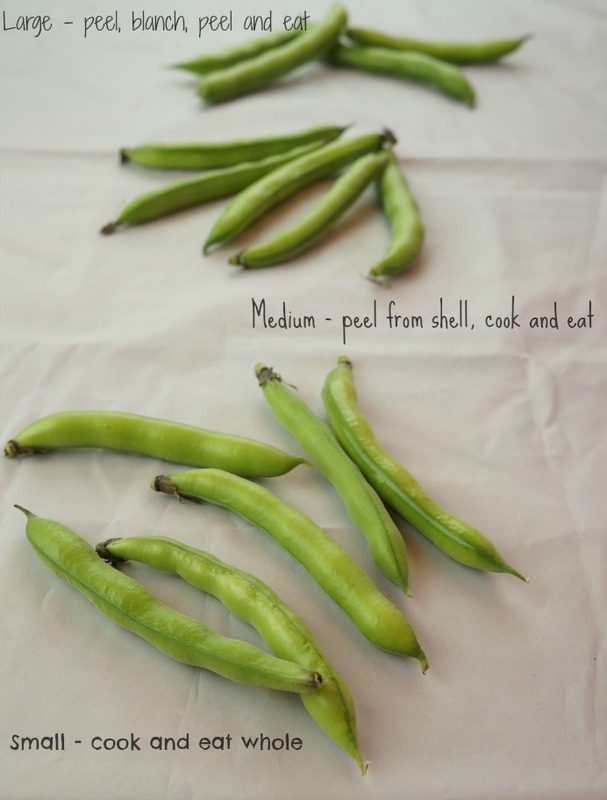 How to Choose Fava Beans? If you are growing fava beans yourself, then you have many options. You can pick them small and enjoy them whole in the pod, or medium, removing the seeds and cooking them much like you would a pea, or wait for them to mature. You can also pick and enjoy the leaves, in pestos or just like you would fresh spinach. If you are buying them in a store or at your farmer’s market, then you will be more than likely only able to get the mature beans. Not that there’s anything wrong with the mature beans – they just take a little more work to get to all their deliciousness. Regardless of the size, you want to make sure that you choose beans that are free of blemishes, a nice fresh green in color AND are closed. When choosing larger beans, feel along the pod and make sure all of the beans are not only present (sometimes half of the shell is empty and you don’t want to be paying for an empty shell); but also that it feels firm between your fingers. This will indicate freshness. Buy as fresh as you can. Buy as fresh as you can. This means buy where other people are also buying them. I can’t tell you how many times I go into a major supermarket and because I’m there buying something, like soda water or milk and I’ll wander into the produce department thinking I’ll get something to use for making dinner, like lemongrass or poblano pepper. I take it to the register and the person checking me out has to ask me what it is. If the checker doesn’t know what it is, it’s because they don’t sell a lot of that item. And if they don’t sell a lot of that item, that means it’s probably not at its freshest. Step away. Go somewhere where the people that use the product, buy the product. Or, when possible, a farm stand or farmer’s market. As I said before, the small ones you can just cook and eat. One of the best ways is to make them much the way I did my Pan Fried Padron or Shishito Peppers, a quick sauté in some hot oil, a squeeze of lime juice, some salt = easy yum. Or coat them lightly with oil and grill them or roast them under the broiler. Just cook until tender, about 2 – 3 minutes. Medium sized fava beans can be opened just like a pea, removing the beans and then cooking them much like you would a fresh pea. I like to parboil them for 2 minutes, and then sauté with other spring vegetables; mint is wonderful with both peas and fava beans. The large mature beans take more work. First, they must be removed from their pod, then you remove them from their first skin, which is tough and bitter, finally getting to that creamy green center. Once there, you can puree them to enjoy on a crostini, make a “hummus” to enjoy as a dip, add them into a vegetable sauté or one of my favorites, Risotto with Fava Beans and Fava Bean Peso. b.) 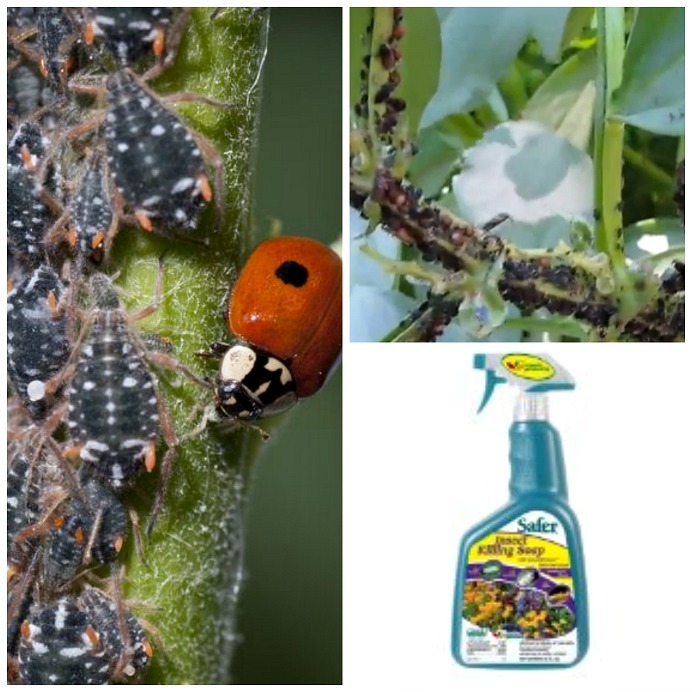 get ladybugs that will eat them up. I did a bit of both, removing the tips of the plants AND getting 1,000 ladybugs. The aphids didn’t seem to mind having to move down the plant to get more food, and the ladybugs, well, it was hard to convince them that this was home and they shouldn’t fly away. After I pulled and threw all those plants away, I replanted new favas in a new place in the garden. As soon as I saw that there was the beginning of black aphids, I reached for my new friend, an organic aphid spray called Safer Brand. That took care of them immediately. You can make your own aphid spray with a combination of soap and water, but I found the Safer Brand product worked perfectly and it was pre-mixed. No guessing on my part and I hate to guess. So far this year, I have had no issues. 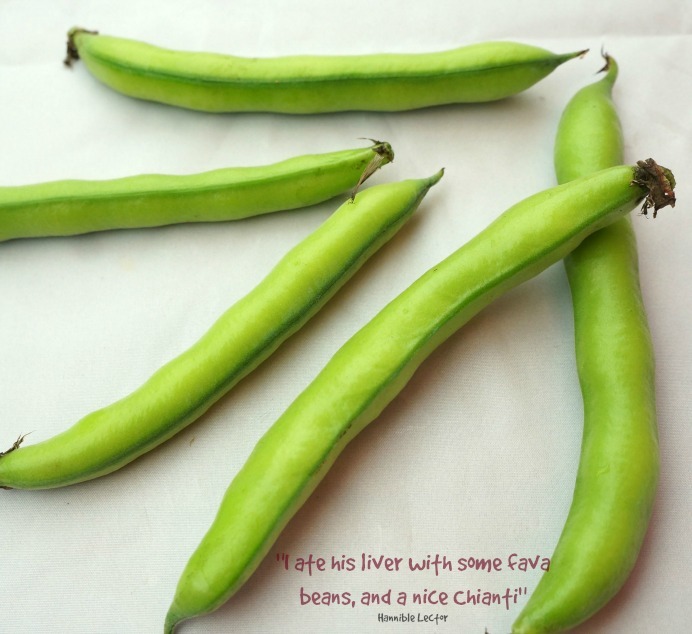 I planted these favas at the end of February and am already harvesting beans. From small to large, and enjoying the leaves. Here’s a short video from a couple of guys to show you how easy it is to plant and grow fava beans. No, I will not give you a recipe on how to make someone’s liver to enjoy with fava beans. And I’m not even sure a nice Chianti will work with them, they seem to be more of a pinot grigio, chardonnay or sauvignon blanc kind of vegetable.